And so triathlon season is upon us; well, kinda. 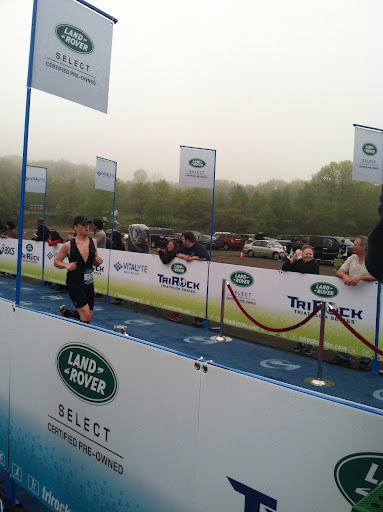 This past Saturday was TriRock New York a sprint triathlon in Harriman State Park in Stony Point, NY. The park is about an hour away from my house, so with an 8 am scheduled start time, Amy and I decided to wake up at 5 and hit the road no later than 5:30. 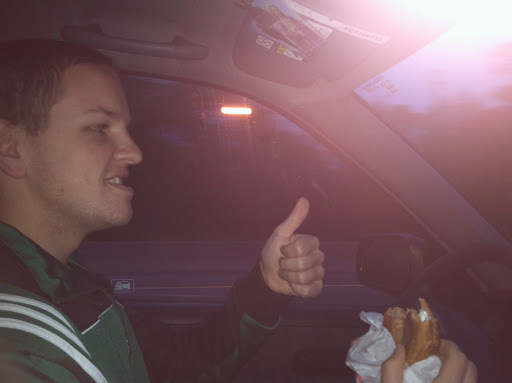 We stopped quickly at Dunkin Donuts, because no one should be up before 6 without a coffee. Sad story here, the coffee was absolutely disgusting. Disgusting to the point that we couldn’t even force it down just for the sake of caffeine. The bagel I got however, was awesome! 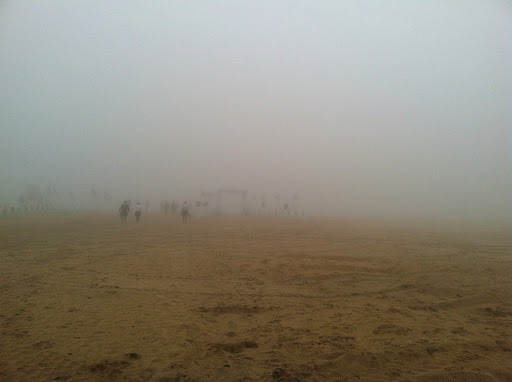 As we neared the park, we began to encounter some fog, but I really thought nothing of this. 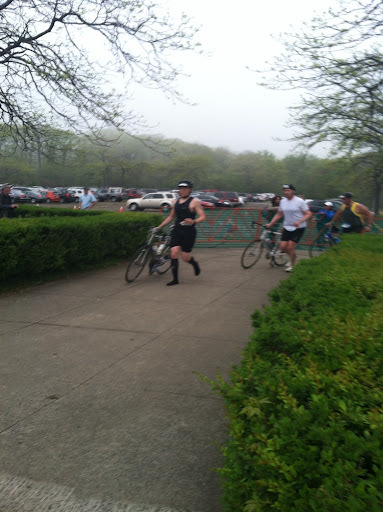 If I remember correctly, there was fog as we arrived to last year’s triathlon at Harriman. Anyway, we pull into the parking lot and unload the car. There was a little bit of fog, but it didn’t really seem too bad in the lot. I walked my bike over to transition and began to set up. I set up my regular transition and can remember thinking “Hmm I wonder which way the beach is from here” After I finished setting up transition, I threw on my wetsuit and went to find Amy. Amy and I were hanging around a few minutes before I went to take care of some pre race restroom appointments. I think that races are one of the very few places you will ever find a line for the men’s room. 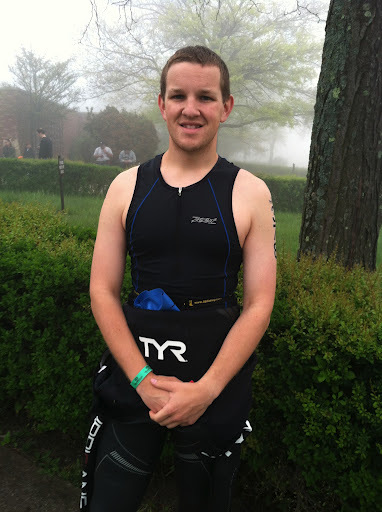 I take care of business and am ready to get into the water to start my first tri of 2012. Remember that thought of where the beach was, as I walked out of the bathroom, I finally got my answer. I walked down a path and finally began to see sand. and put on my run gear. 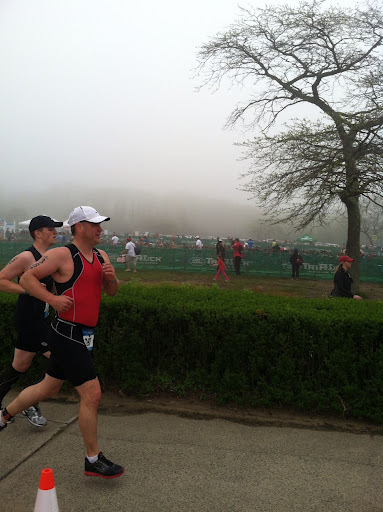 I tell Amy, “Well there goes any shot I may have had at the podium today.” The swim is one of my strongest disciplines of the triathlon, and I usually have one of the better/best swim times in my age group…and one of the worst run times. I just knew that adding an extra run leg would allow my competition to open up an even bigger gap on me when normally I would be ahead or neck and neck after the swim leg. Now that I have expressed my sadness over the lack of swim…lets get to the recap! Okay, so the race started in the same waves we would have been in had we done the swim and I was in wave 4. The waves were sent off in three minute intervals, so some of the runners from wave 1 returned and were out of T1 before my wave even started. 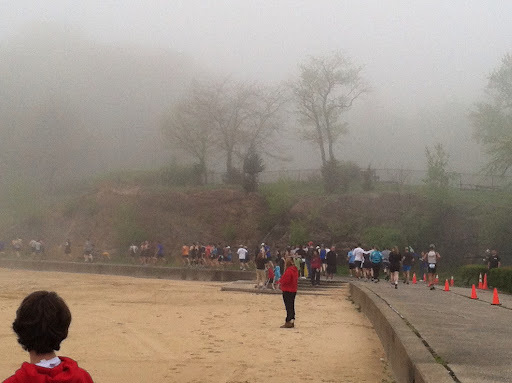 Here’s what we saw from the start line…a big group of runners heading into a foggy abyss, not knowing what was waiting on the other side. The first run leg went by pretty quickly. I stayed with the main pack of my wave, and finished the 1.2 miles just under 10 minutes with a pace of 7:41 min/mi. One small hill up and one coming back down. It was nice to have run this, because we would be repeating this same loop two more times for the second run leg. Run 1 – 9:59 7:41 min/mi. The bike leg was an 11 mile loop with some rolling hills. Some of the hills were a little rougher than others, but nothing compared to the hills on last year’s course. My top speed was in the mid 30s on a down hill, and my minimum speed was around 12 MPH on one of the steeper uphills. My bike performance has increased since last year. I think a variety of factors has led to this increase. Simple strength increase in my legs is certainly something that can be thanked. Having to push less weight on the bike can also be thanked. And I feel my conversion to bike shoes and clip less pedals has certainly helped. Run 2 I knew was another two laps of the loop we had already run for the first run leg with a small addition about half way through the loop. I got off the bike, and was ready to run. Grabbed my hat and slipped my run shoes on and headed out on my way. 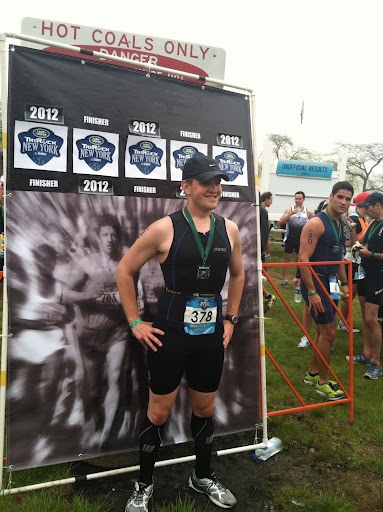 I felt pretty good running the whole time…which tells me I probably could have pushed myself a little harder. (Things to keep in mind for my next Tri) I have to say in my past triathlons, I never walked, but I ran pretty slow and was passed by a lot of other people. It was a great feeling to be on the other side of that situation on Saturday. I was running hard and moving past several people on my run leg. I have greatly improved my running abilities and speed over the winter which was exactly what I was hoping for! Overall, very happy with my performance at DuRock NY. I plan on being a force to be reckoned with this triathlon season!